Webmin is a web based tool for Linux, it helps to manage the services like DNS, DHCP, MySQL server, PostgrSQL and other networking services. It also helps to manage the user, disk, file system, process, packages, etc.. 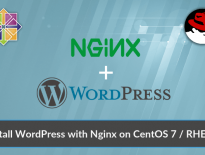 This post will guide you to install Webmin on CentOS 7. Auto start webmin at system startup. Webmin listens on port no 10000, allow it on firewall. You will be asked to enter username and password. Use root username and password.